Shirts With Random Triangles: USC adds cornerback prospect Isaiah Langley to its 2015 recruiting class. USC adds cornerback prospect Isaiah Langley to its 2015 recruiting class. USC has added another part of its 2015 recruiting class with the edition of Pleasanton, California high school rising senior cornerback/wide receiver Isaiah Langley. The ESPN 300 CB (rank: 83rd) committed to the Trojans on Monday. Langley went for the dramatic on Twitter, taking not one, but two tweets to announce his decision. 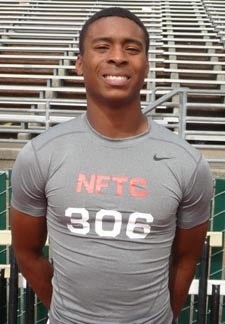 Langley's 247Sports.com composite intangibles are as follows: Langley is a four-star rated WR/CB. He ranks seventh among 2015 CB prospects, twelfth among California state prospects for 2015, and 86th overall among all 2015 prospects. Langley attends Foothill High School in Pleasanton, Ca. He stands 5'11, and weighs 170 pounds. Langley becomes the tenth member of USC's 2015 recruiting class.